Z900:n muotoilu on Z-malleille tuttua aggressiivista ja terävää. Kapea ja linjakas muotoilu korostaa pyörän keveyttä ja sporttisuutta. ø41 mm inverted front fork features stepless rebound damping and spring preload adjustability in the left fork tube. Adjusters are conveniently located on the fork top cap. Rear suspension positions the shock unit and linkage above the swingarm. This arrangement contributes to mass centralisation, while ensuring that the suspension is located far enough from the exhaust that operation is not affected by heat. One of the key components to the new Z900’s light weight (noticeable as soon as the bike is lifted off its side-stand), the allnew trellis frame weighs only 13.5 kg and contributes significantly to the bike’s light, nimble handling. Shape of the airbox was designed based on acoustic tests carried out in a sound room. 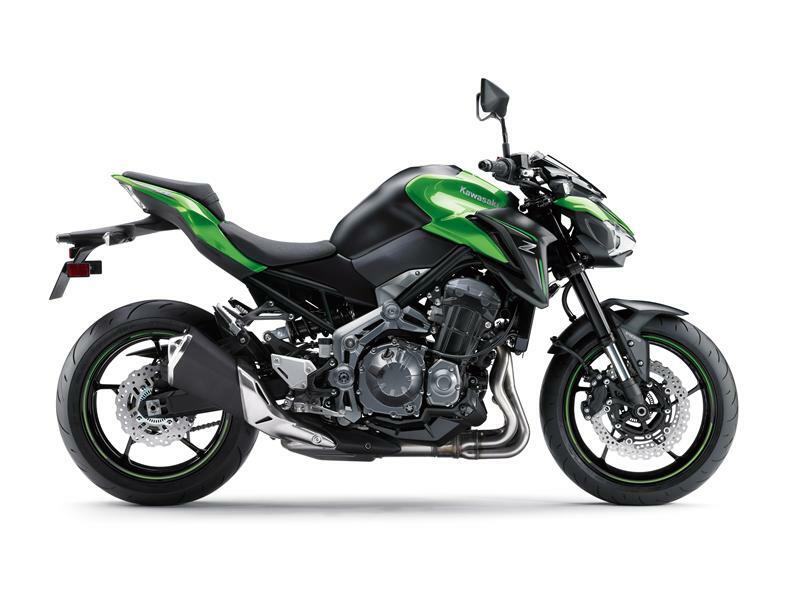 The intake note of the Z900 is clear and mild. The frequency of the note varies with engine speed, adding to riding impact – especially at high rpm. Airbox inlet faces upwards, making the intake note easier to hear for the rider. With the wide, flat handlebar and relaxed, sporty riding position, the rider is easily able to capitalise on the Z900’s sporty street riding potential. The riding position offers a blend of control and comfort that allows the rider to enjoy a variety of riding situations. Tuned to give a maximum of 70kw in line with the demands of A2 compliance, this version of the Z900 can also be adjusted to provide a maximum of 35kw, again to comply with A2 restrictions and the needs of motorcycle training schools. Achieved via an adjustment to the on-board ECU at an authorised Kawasaki dealer, the adjustment is neither time consuming or irreversible so, when the time comes, it is possible to revert to 70kw again via a short visit to the authorised dealer who will also create and update a record of the status of the machine. Thanks to the low seat height and the bike’s slim overall design, it’s easy to keep both feet firmly on the ground when stopped, an important consideration for many riders. Thanks to the low seat height and the bike’s slim overall design, it’s easy to keep both feet firmly on the ground when stopped, an important consideration for many riders. The 948 cm3 liquidcooled, 4-stroke In-line Four engine delivers 70 kW and has a quick-revving character. Silky smooth power delivery facilitates control while contributing to rider comfort and confidence. Stacked instrument cluster features an easy-to-read layout. Analogue-style tachometer features a gear position indicator at its centre and sits atop a large multifunction LCD screen. The tachometer’s three riderselectable display modes add a visual element to riding enjoyment. Hairline finish on the tachometer dial, and carbon-fibre-style panelling contribute high-quality touches. Kawasaki has long believed that Supernaked models should be more than supersport machines stripped of their full-fairing bodywork. Designed with Sugomi performance for maximum riding pleasure, the Z900 mounts a 948 cm3 In-Line Four engine in an all-new ultra-lightweight frame. The choice of a 900cc-class In-Line Four was no accident; every twist of the throttle is rewarded by crisp, smooth response and exhilarating acceleration. Assist & Slipper Clutch was developed based on feedback from racing activities. The clutch uses two types of cams (an assist cam and a slipper cam), offering light operating of the clutch lever and preventing a blocked rear wheel when down shifting and abruptly releasing the clutch. ERGO-FIT mahdollistaa erikokoisten kuljettajien saamaan pyörästä itselleen mahdollisimman hyvän ajoasennon. ABS-järjestelmä estää etu-ja takapyörän lukkiutumisen jarruttaessa liukkaalla tienpinnalla tai kovassa jarrutuksessa ja helpottaa kuljettajaa hallitsemaan pyörää. Takajousituksessa vaimennusyksikkö on takahaarukan yläpuolella vaakatasossa. Sijoituksella saadaan enemmän tilaa suuremmalle äänenvaimentimen esikammiolle, jolloin voidaan käyttää pienempikokoisia äänenvaimentimia. Moottorinohjausyksikkö kontrolloi polttoaineensyöttöä ja taloudellisen ajon ECO-merkkivalo ilmaisee, kun ajo on taloudellisinta.